After the tour, a Student Recruiter-Advisor will be available to answer your questions about UBC’s undergraduate academic programs, admissions information, scholarship opportunities, and more! Please note: These tours are for prospective undergraduate students, their families, and guidance counsellors. Groups of five or more will need to request a group tour. To register, view our tour calendar and choose a campus. If you have trouble registering or have any questions, please contact us. Your tour will meet in Brock Hall (1874 East Mall). If you are driving to UBC, we recommend that you park in the North Parkade (6115 Student Union Boulevard). Brock Hall is west of the North Parkade. If you are taking public transportation to UBC, TransLink can help you plan your route. We recommend that you print out directions and a campus map to bring with you on your tour. And keep in mind that the tour is outdoors, so please prepare for the weather. Browse on- and off-campus accommodations to extend your stay and enjoy Vancouver, one of the world’s most liveable cities. Visit Tourism Vancouver to discover the city’s most exciting attractions, best restaurants, and myriad activities – from biking to whale watching. Plan your visit around one of the many UBC events taking place on campus. If you’re interested in the Bachelor of Commerce program, consider attending an info session (which includes a building tour) right after this campus tour. Register now. Learn more about UBC attractions, such as the Museum of Anthropology, to explore while you’re on campus. Make the most of your visit by booking additional programming for your group tour, which can include a Longhouse tour and info session, a Museum of Anthropology tour, a Peer Mentor info session, faculty-specific info sessions, and much more. If you are not part of a group, but would like to meet with an Aboriginal advisor after a general campus tour, that’s possible too. To book additional programming or a meeting with an Aboriginal advisor, please contact us at aboriginal.tours@ubc.ca. 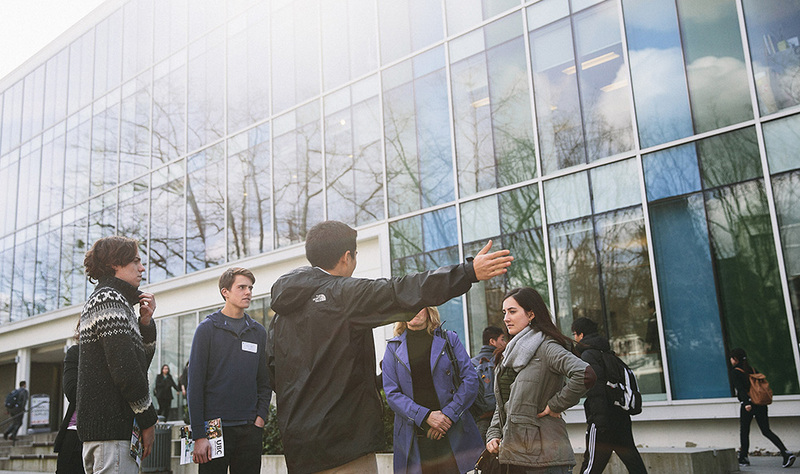 If you’re not a prospective undergraduate student, you’ll want to check out UBC’s campus tours for alumni and visitors. The City of Vancouver is a vibrant metropolis surrounded by majestic mountains and the Pacific Ocean. Consistently rated one of the best places in the world to live, Vancouver could be your home for the next four years. Learn more about the Personal Profile component on UBC's application, and find out how to put your best foot forward.